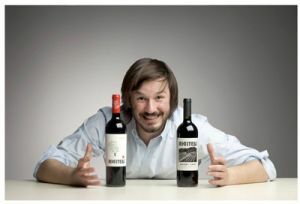 A brand that is already widely respected in Argentina for crafting excellent, terroir-driven Mendozan Malbec, Matias Riccitelli showcases his award-winning wines with cheeky, nontraditional labels. Riccitelli represents the new generation of winemakers in Argentina who are interested in breaking with tradition, exploring new terroir and infusing personality into the winemaking process. Riccitelli’s vineyards cover 20 hectares across three different sites within the premium growing region of Lujan de Cuyo, Mendoza. Situated at the foot of the Andes Mountains between 980 and 1120 meters, Riccitelli maintains low yields and oversees careful management of his vines, some of which were planted in the early 20th century. Riccitelli hails from a prestigious winemaking family as the son of Jorge Riccitelli, the highly lauded winemaker for Bodega Norton winery. With his generational knowledge and experience gleamed from working harvests all over the world, Riccitelli’s independent label, which he launched in 2009, shows his acumen as a world class winemaker in his own right. As such, Riccitelli’s wines demonstrate both the power and elegant complexity that Malbecs from this region are capable of.